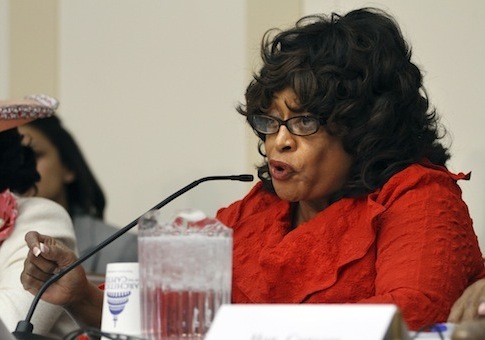 An FBI agent testified against former Democratic Rep. Corrine Brown (Fla.) on Wednesday, stating that money from a charity intended for children's education really went into the congresswoman and her daughter's shared bank account. In July of last year, Brown pleaded not guilty to a 22 count federal indictment in relation to a non-profit charity. A majority of the charges stem from her connection to the defunct charity One Door for Education that prosecutors believe she used as her own personal bank account. FBI special agent Vanessa Stelly testified against Brown on Wednesday detailing her bank records, according to the Jacksonville news website. Stelly stated that money was being withdrawn from the One Door for Education's bank account in Maryland and being deposited into Brown's account at a Bank of America nearby. "Jurors were shown ATM images of Brown’s former chief of staff, Ronnie Simmons, collecting money at a drive-through lane, then standing at a counter of the second bank with cash in hand," Jacksonville reported. Stelly then disclosed information about Brown's balance inquiries into her bank account. The FBI agent said someone used ATM's to check the balance in Brown's account in Jacksonville and Fort Lauderdale. On these dates, Brown was in those cities while Simmons was in Washington. Brown's daughter Shantrel was involved in her mother's alleged scheme as well. Stelly testified that a $3,000 donation from the education non-profit was transferred into a joint account between Corrine and Shantrel. If convicted, the former Democratic congresswoman would face 357 years in prison and a $4.8 million fine. This entry was posted in Politics and tagged Congress, Corrine Brown, FBI, Florida. Bookmark the permalink.